Asking people to turn on notifications seems smart, but what’ll happen when people start getting notified? How long do you think it’ll be before they’re sick of all the notifications making their phone go crazy all day long? With the average user following 822 accounts on Instagram (the median is 265), that’s a lot of notification, especially when many post multiple times each day. Even with the median number of followers, it won’t be long before most are overloaded with notifications and choose to turn them off. And that’s the first problem. Turning on notifications is an engagement signal to Instagram (and Facebook). It tells them that you really like the account and want to see more updates from them. But, if they turn notifications off on your account, it’s seen as a sign that they want to see less from you. The new algorithm-based news feed will then show users less of your posts, because they’ve indicated that they don’t want to see what you’re sharing. In addition to viewing turning off notifications as an indication they don’t want to see your posts, this action will also impact your ability to reach those that don’t have notifications turned on. Like Facebook, the actions of those you follow impact the reach your post sees once the algorithm kicks in. Even the best accounts aren’t going to be able to get the majority of their followers to turn on notifications for their posts, so even a small number of people turning off notifications will lower the total reach of your posts to the rest of your followers. Generally, if someone turns on notifications, they REALLY want to see what you’re sharing. Since most never turn them on, if they pick your account they must really love what you have to share. There’s a good chance that they’re one of your most loyal followers and engage with what you share frequently. Now, what happens when they turn on notifications for everyone? Are you as special anymore? Do you still stand out from the crowd, or are you just another one of the countless accounts they’re being notified about? Suddenly things don’t seem so special anymore. A genuine notification selection is great, but a forced (asked) one doesn’t have the same impact and won’t likely gather the same engagement. Ignoring the technical aspects that can impact engagement with our followers, what might notifications do to the relationship you have with your followers now? I like plenty of brands, but how am I going to feel when my phone goes off every time they post a picture? How quickly will people become annoyed with those notifications and not only turn off notifications but possibly tune them out or even unfollow? By asking people to turn on notifications we risk turning ourselves into annoyance to our followers. We become the family member that calls every time any little event happens. We frequently learn to tune out brands that bother us online and these bothersome notifications have the power to make that happen fast. With the new Instagram algorithm, we have a chance to stand out from the crowd. Those that post the most engaging content will have their content shown at the start of our followers feeds. No longer will they have to scroll through 50 or even 100 updates to find your great content in a sea of mediocre. But that changes when everyone has notifications on. If people are getting notifications from all the accounts they follow, what’ll make you stand out from the rest? How will the little text notification on their lock screen set you apart from others? It won’t. You’ll just be another line of text among the others. Enjoy the mediocracy. Part to what drives engagement is surprise. We’re flipping through our feed when we come across something we weren’t expecting, it catches out eye, and makes us smile. It’s that surprise moment that causes us to form a connection and engage with those we follow. Turning notifications on takes that away. With a notification on, people already know what they’re going to find. They get the notification on their phones lock screen and get to make the choice to engage or not based on what little information is provided there. You’ve now lost not only the ability to surprise and delight a follower with your content, but their choice to engage if now based on the tiny bit of text from the start of your Instagram update which displays on their lock screen. How likely do you think that’ll be to drive people to look at what you have to share? Much of why we engage with others on social media is due to when we’re engaging with it. We go on Facebook, Twitter, and Instagram when we’re bored, when we want to unwind, or when we have some free time to kill. 93% of adults age 18 to 29 admit to using their phone to avoid being bored, according to Pew’s 2015 Smartphone Use report. But what happens when we try to engage when our followers aren’t in the mood? Where most look to engage on their own time, notifications make it more on our time. They tell the user that NOW is the time to engage, not the time of their own choosing. Yes, some will wait until they’re ready to check Instagram but most have been trained to answer notifications right now. If they aren’t at a point where they can fully engage (such as the middle of their work day or on the highway), the chances they will engage are far lower. Making those moments take place on your time rather than their own will lower engagement and lower engagement will then lead to less reach thanks to the new Instagram algorithm. After exploring the impact, it seems clear that there are far more potentially negative effects that can arise from asking your following to turn on notifications for your posts, than positive. What seemed like a good idea on the surface is clearly a risk we should think twice about taking. Before jumping on any bandwagon it’s best to consider all the benefits but also potentially negative impacts of your actions (and they may not be clear at first look). 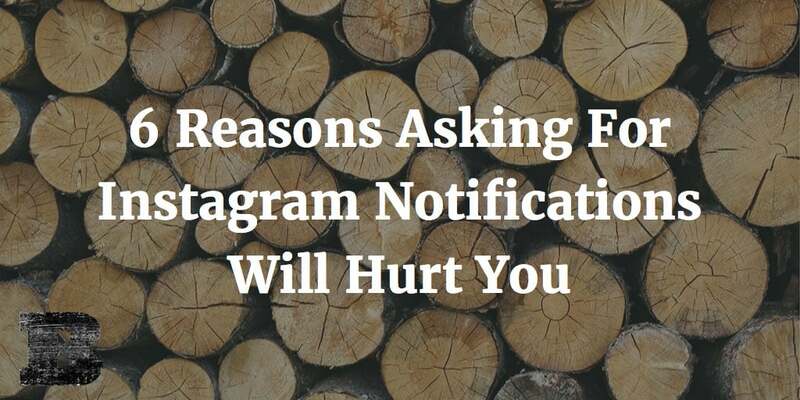 By being aware of how asking people to turn on Instagram notifications may mean less engagement in the future, you can avoid a costly mistake to your Instagram success and change your focus to bringing about better results in the future.